Because I color my hair, and my eyebrows are naturally very dark, I have to bleach them from time to time to compliment my hair :) (the things girls go through lol) It takes me anywhere from 10-15 minutes to do, because I usually have to bleach them twice for the color to take (as you can see above). **BEFORE ANYTHING: Test out the bleach on a small patch of hair on your arm & wait 24 hours to be sure you don’t have an allergic reaction. 1. Wash the eyebrow area with cold water and a gentle face wash.
2. Take the spatula and measure out about one half teaspoon of creme. 3. Clean the spatula, and measure about a quarter teaspoon powder and place on the tray. Mix well. 4. Apply the mixture with the spatula and completely (& carefully) cover the area of hair you want bleached. 5. Leave on for 10 minutes. 7. If the area isn’t as bleached as you would like, reapply the mixture and apply for another 5 to 10 minutes. 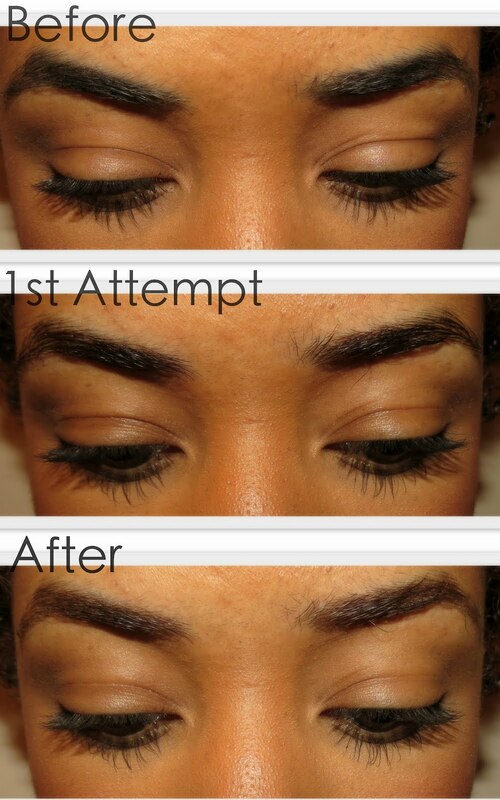 Have you ever bleached or colored your brows to better match your curls? I too bleach my brows with Jolen to match my curls. My curls are brown auburn (compliments of Dark & Lovely's Rich Auburn), and I bleach my brows to a soft chestnut brown. I love the way it softens my face and compliments my hair color! I always bleach my brows after I color my hair. I use the Sally Hansen Bleach mixture which works great. 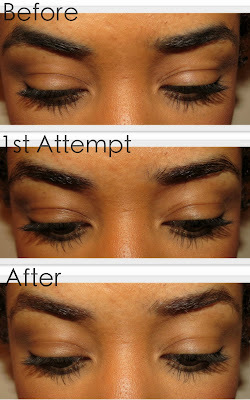 If you have never bleached your brows before or have really dark color brows it will take a little longer. Mine normally takes 8-10mins with bleach mixture applied depending on what color I am going for. Sometimes I experience a slight/very very small tingling on my brows but it doesn't hurt. And I agree with one of the commenters...your lashes are amazing! what color is your hair. what kind of dye did you use? I don't have enough eyebrows to do anything but fill them in with black powder. Yes, black. LOL. It works for me, don't judge. McKenzie, btw, is so beautiful! Your skin is lovely! I bleach my brows because I have to fill them in when applying makeup and it keeps them from appearing too dark. I'm currently filling them in with a reddish tone to match my hair color. Is there anyway to undo it? or its permanent? Thanks for this necessary post! I've been thinking about bleaching my brows for months now. I have never dyed my hair, not when I was relaxed and not now either, but I do feel like as I learn more and more about makeup that my brows are much too dark for the kinda dimension I want for my face. I will definitely be bookmarking this. I did when I was relaxed. But my eyebrows were orange by the time I finished. I like the way yours came out. They're beautiful! The final product came out looking really good. Is that stuff strong especially for those with sensitive noses or prone to asthma? Those earrings are nice saw a pair like that at Target. I've never bleached my brows. For whatever reason, when I think of bleaching my hair I just have visions of it turning out completely white, devoid of any color. ETA: S1mnIcity is the youtuber forgot to put that in as well. WOW you very very pretty!!!! As far as bleaching the eyebrows that's doing the most. I have enough to keep maintained (as a woman) no time for bleaching eyebrows over here. I'm with Anonymous @ 1:48, what's your secret to those fabulous lashes! When I color my hair red I bleach my brows to blonde and then color them red. I use the Sally Hansen extra strength facial bleach....it gets them really light. Her tumblr is the bomb! I have been using Sally Hansen for years. I love that they put a $1.00 coupon on the instruction pamphlet. I use it regularly on my 'STACHE yall - and between and beneath my brows to lighten fine hair that can look like shadows. Shadows on your face can make you look older. You can even use the bleach on your "sideburns". Sally Hansen stinks AND it stings my upper lip, but it doesn't cause pimples like waxing does. I bleached my brows too light once, and it made me look washed out. I may try it again one day now that I know better. I recommend you start with less than the recommended time, and repeat in a few days if it isn't light enough. I really love the Maybelline "Define-A-Brow", and Mac brow pencil in "Spiked". wow you are beautiful and this looks relatively easy! i must remeber it next time i dye my hair! This post is right on time. I just had my hair color retouched and was just thinking my brows were too dark and that I needed to lighten them. My hair is a reddish, coppery color and the dark brows don't look good with the hair IMO. Thanks for sharing. Your hair, color, and brows are fabulous by the way. I think it's neat to match the two hairs. I haven't colored my hair or my brows, but this is very cute on you. I would have never thought of it. NICE! Thanks for the tip!! I used to bleach my eyebrows, but haven't in a long time. I'll have to try it again. Thanks girly--tried it and loved it--it's subtle but I can tell the difference and I have thinner brows but right for my small eyes. To avoid the chemicals in the body, a natural way to bleach would be to use honey and lemon. Lemons are acidic by nature and are natural bleachers. It is also used for the skin. That could be an alternative.